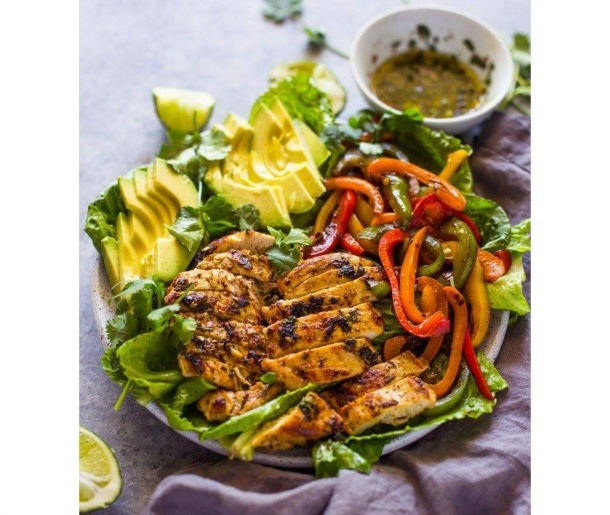 Today’s WINNING recipe to meet Coach JC’s 10 WINNING Habits isGrilled Fajita Chicken and Avocado Salad. Where are my healthy fats? Where are my veggies? Where is my lean protein? Whisk all the ingredients for the dressing/marinade in a bowl. Pour half the mixture onto the chicken breasts and coat them with marinade well. Cover and place in the fridge for 30 minutes or up to 24 hours. Reserve the rest of the marinade for later to be used as dressing. Heat a large pan over medium-high heat for 2 minutes. Add a teaspoon of avocado or olive oil to the pan and then add the chicken breasts. Cook 4-5 minutes per side or until cooked through. Remove from plan onto a cutting board and cool for 5 minutes then slice or shop into bite size pieces. Add the sliced bell peppers to the pan. Cook on high for 1 – 2 minutes or until charred. Divide romaine lettuce into two salad bowls. Top each salad withal the chicken, fajita veggies, and sliced avocado. Serve with the desired amount of reserved dressing.